Achieve soft, smooth and thoroughly hydrated skin with the Hibiscus and Fig fragranced Mineral Botanic Velvet Cream Wash from AHAVA. 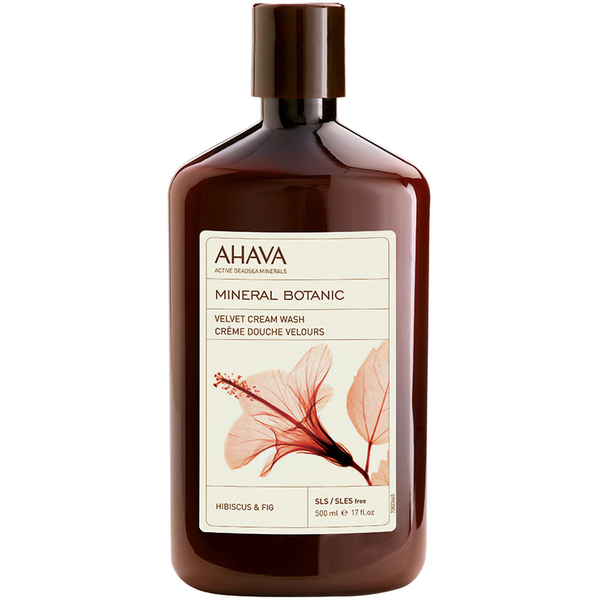 The luxurious body wash is enriched with Dead Sea minerals and a blend of Vitamins and Antioxidants. Kind to skin, the uplifting formula contains Hibiscus extract that boasts moisturising properties to promote the healing of dry skin and Fig extract that contains anti-inflammatory properties. Aqua (Water), Ammonium Laureth Sulfate,Cocamidopropylbetain, Glycerin, Peg 7Glyceryl Cocoate, Cocamide MEA, MarisSal (Dead Sea Water),Styrene\Acrylamide Copolymer, PEG-16Macademia Glycerides, Ficus Carcia (Fig)Fruit Extract, Hibiscus Sabdriffa FlowerExtract, Disodium Laureth Sulfosuccinat,Polyquaternium 7, Parfum (Fragrance),Guar Hydroxypropyltrimonium Chloride,Decyl Glucoside, DMDM Hydantion,Sodium Hyaluronate, Allantoin, XantanGum, Citric Acid, ButylphenylMethylpropional, Benzyl Salicylate, HexylCinnamal, Limonene.